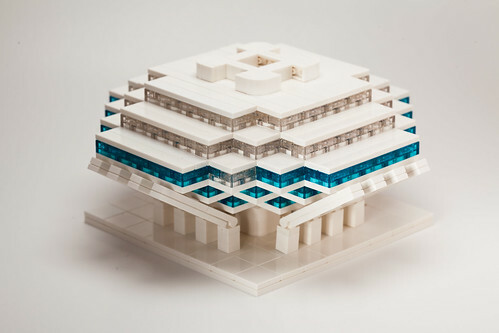 This model of the Geisel Library is featured in my book: The LEGO Architect. 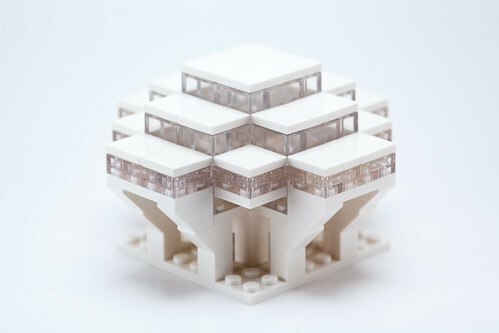 The book includes a whole chapter devoted to Brutalist architecture, including photos of real buildings, amazing LEGO models, a brief history, and instructions to build two models in this style. I am excited to have my first LEGO models on display at BrickCon this weekend! I attended the private convention today, and tomorrow we open the doors to the public to see a great selection of impressive LEGO models. 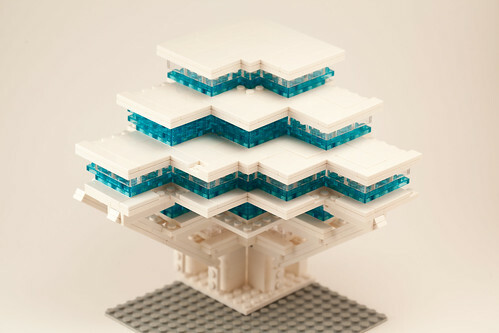 The largest of the models I’m displaying is a LEGO re-creation of the Geisel Library. Geisel Library (1968) is a large Brutalist-style building on the UCSD campus in San Diego, California by architects Pereira & Associates. It’s a much loved example of Brutalist architecture, a style which celebrates massive, angular forms made of reinforced concrete. While some brutalist designs are dark and feature relatively few windows, this building is flanked on all sides by massive floor to ceiling windows reminiscent of the simpler Modernist buildings of about the same era. 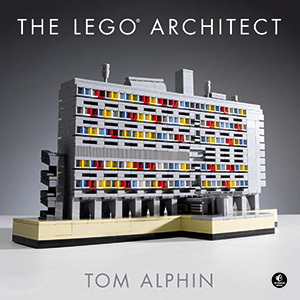 I’ve actually never visited the building – it caught my attention in exploring popular Brutalist buildings and I was excited to re-create it in LEGO. It took several tries to finalize my design for this building. 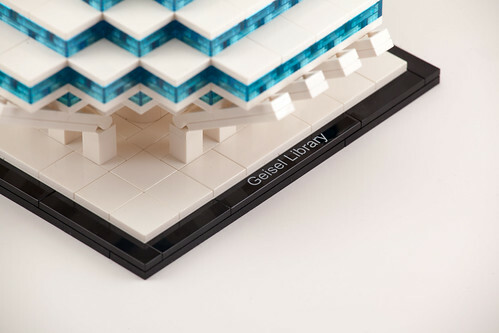 Since one of my biggest gripes with the recent book LEGO Architecture: The visual guide is that it only briefly touched on the creative “making of” process for the various sets in the series, I’ve prepared a sneak peek into my creative process in building this model. My first serious attempt at building the model involved finding some rough cross-sectional drawings of the building and drawing out the shape of each floor on graph paper. I translated each cube-like step of the form as 4×4 tiled roof sections. This scale would allows some nice subtle details to show through. I kept working at this for a couple evenings, and finally completed a single corner of the building which was actually pretty sturdy thanks to employing a 3/4/5 triangle for the angular bracing “concrete” supports. (Thank you to my geometry teacher/mother.) I ended up using a mix of clear and trans-blue for the windows, but the overall effect was pleasing. Unfortunately, I was almost completely out of pieces, and a rough back-of-envelope guess would have placed the completed model at about 500$ in parts, and a large enough model that I’d be lucky to finish it before BrickCon. Only 1/2 completed, but carefully photographed to help the final form emerge. Renewed by my miniaturized success, I set out to finally complete the whole building at a reasonable scale. With all 5 stories and 2×2 studs per step, we end up with a model which is a little over 20-studs wide. This first exploration looks complete, but it is only one side of the model which was carefully photographed to hide the other side. Now it was time to get it finished. This is the first photo where the final shape is completely constructed, although the base is smaller, the tile roof is mismatched and I had to use two different colors of transparent brick. Each level is constructed as a separate ring module which snaps to the floor beneath it at the corners. This was an earlier version of the central core than the final design, which is much more rigid and durable so it can travel more easily. Creative SNOT construction on the roof. The roof detailing presented some additional challenges. After finding some aerial photos of the building, I learned that there is a service core on the roof, likely comprised of Air Conditioning, elevator shafts and other infrastructure. It mirrors the same curved form as the central column at the base, which I built using curved bricks and SNOT technique. Attaching it to the roof presented some fun challenges, since it is difficult to reverse the direction of LEGO to put studs facing downward. Finished model with a custom engraved nameplate tile! I’m really excited about the finished model. It’s not huge but it’s really detailed, and I think it really captures the spirit of the original building. Maybe I’ll get to visit the real building one day! See more photos at my Geisel Library gallery on Flickr. What do you think of my first decent-sized MOC? Any ideas to make it better? I’d love to hear your thoughts, so leave a comment below! 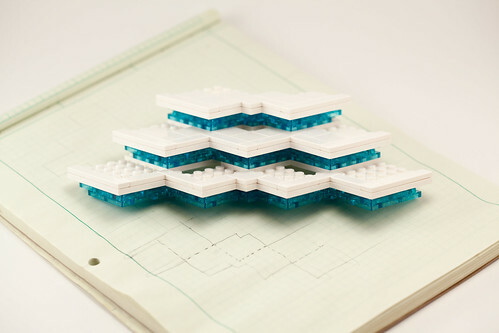 Next story Building a winning Microscale LEGO model! Very cool. Have fun at BrickCon. You have got to be kidding me! I was at UCSD last weekend and saw Geisel Library and thought to myself “this would make a great architecture set!”. 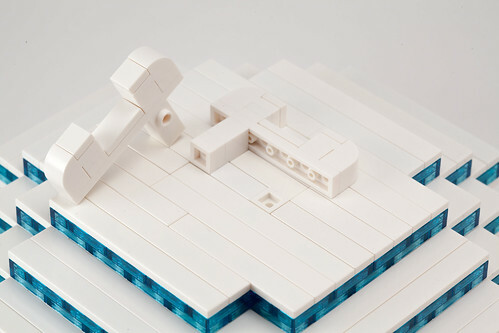 I got all excited because I thought I had an original idea, but then I saw this on Brickset. It seems you’ve beat me to the punch! This is an excellent model, well done! you should consider submitting this on LEGO Ideas. I really impressed by this design. Same thing I want to do the creativity thinking by the LEGO ideas. So impressed! If it were an available official set I would buy it in a heartbeat, especially as a San Diego resident. Thank you for sharing this model. 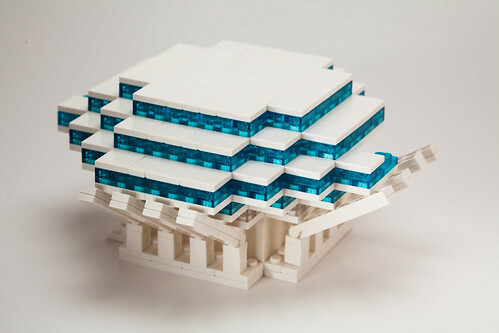 I love to see this in LEGO architecture stile and would like to see it as a real set. Unfortunately I am an impatiant person, so I am so impressed, that I really had to build it right now. A great design captured in bricks. What a beautiful piece my son and husband would love to have this. Will it ever become available to the public? Brings back great memories of the College days! I don’t have any plans to make this model available for purchase as a set, or as a set of instructions, but maybe i’ll consider it this winter after the excitement of my new book has calmed down. I would like to purchase this MOC set. Please contact me. Just saw your models at BrickCon and was so excited to see the library!! As an alumni I would love to see this set made available to the public! 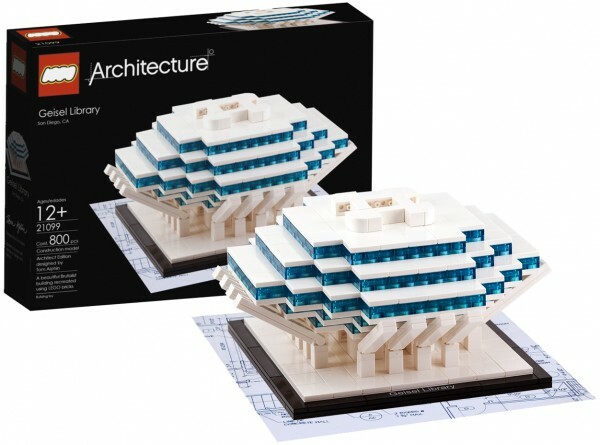 Really a very cool set, that would sit perfectly alongside my other architecture sets. I would not tell from the photos that it is a MOC – great work. Would happily buy the design, parts and name plate for this to sit on my shelf. @Richard, Maybe one day I’ll get a chance to create instructions and a partlist. 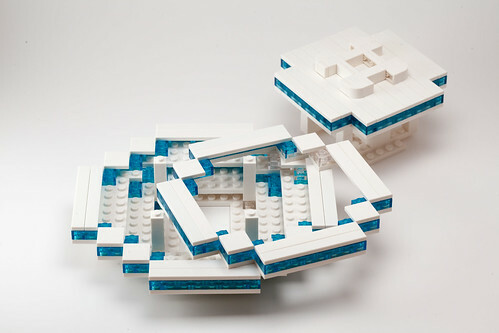 In the meantime, I made instructions for one of my smaller models which will be published in a LEGO magazine soon!